The 10th anniversary season of the Kontinental Hockey League reached its climax on Sunday in Kazan, when Ak Bars won its fourth and decisive victory in the final series, thus clinching a 4-1 win over CSKA Moscow and becoming a three-time winner of the Gagarin Cup – an achievement unmatched in the KHL. After the hooter signalled the end of the game, KHL President Dmitry Chernyshenko shared his thoughts on the League's jubilee season and congratulated the Kazan club on its victory. - We had a wonderful final, and it is fitting that we had sent the puck and a replica of the trophy on a journey into space. This was a fascinating, action-packed season, which included our first ever open-air games, in Helsinki and Riga, two epic seven-match series in the Gagarin Cup playoffs, and some unexpected names qualifying for the knockout stage. There were many new breakthroughs and many, many brilliant moments that will linger long in the memory. The final turned out to be another surprise,considering so few correctly predicted the eventual winner. Nevertheless, this is why we love our great game so much - for its unpredictable nature, even though the best team always wins in the end. As a result, the spectators, viewers, and all the fans can be considered winners, too, as it is they who benefit greatly from the drama. Of course, it is surprising to some that, after eight years, the trophy has returned to Tatarstan. The whole Republic is now rejoicing, and no wonder - becoming the only club in the League to have won three Gagarin Cups is cause for great celebration. 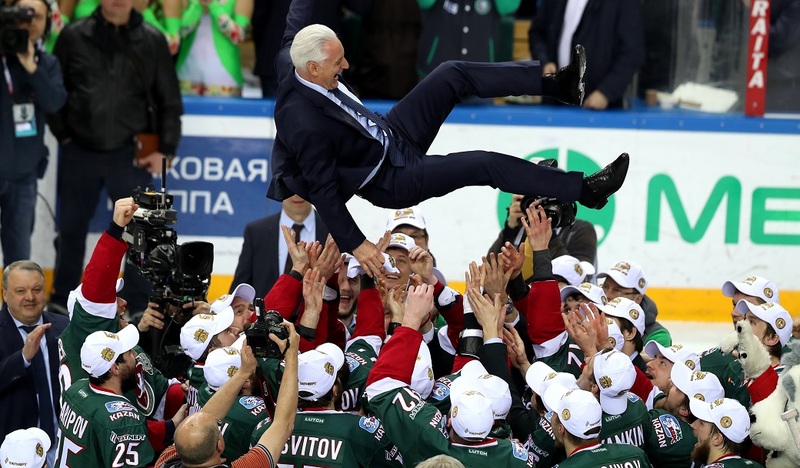 Ak Bars fully deserved this moment of glory, and we should also thank and praise the fans in Kazan. If only every hockey match at every arena had so many parents and children with such a passion for the game. They created just the kind of special atmosphere we need, and we congratulate every one of them! Of course, from a commercial and marketing point of view, we would have happier if the final series had continued so that we could all enjoy the full seven games. However, here in Tatarstan everyone was cheering for a swift victory. The opponent in the final, CSKA, is the club whose players provided the backbone of our heroic gold-medal winning roster at the 2018 Winter Olympics, and they made a great contribution to the prestige of our country. CSKA tried its hardest to win, and the players battled courageously. You can see how much respect the opponent has earned from these wonderful fans here at the stadium. Being a gracious winner is also something to be extremely proud of, and it sets a fine example to others. Once again, many thanks to Kazan. The next season will be an interesting one, as we are entering an era of facing new realities. We will have financial fair play, three clubs are currently undergoing a financial audit, and we will be gradually lowering the wages cap. This will lead to a more even distribution of star players among the clubs and throughout the League. It will raise the level of competition and attract more youngsters. You will see this come true, and I hope you remember my words. The game will become even more exciting.